Sounds like a real Animal House. Just a few weeks ago a little piece of Disney Infinity was unveiled in the form of the Pirates of the Caribbean Play Set, showing off some of Jack Sparrow's moves along with a quick Kraken shot or two. Now we've got a taste of the Monsters University Play Set, which includes characters from the upcoming movie engaging in college pranks. You know, basic stuff like paintball fights, TP-ing the quad, and stealing the rival school's mascot. 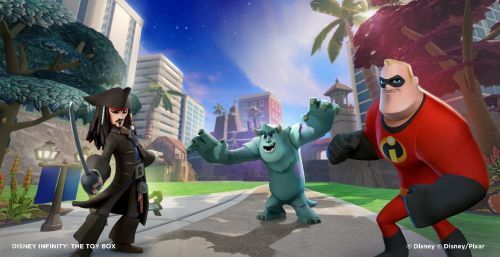 The basic premise of the action adventure game Disney Infinity borrows characters from Disney franchises and packages them in different play sets. These sets are purchased separately and come with real world figurines that can be placed on the Infinity Base to make them appear in the game. It's a gimmick that's been done before, sure, but there's a certain childlike appeal to creating a solid link between a physical Disney toy and a video game. Disney Infinity is scheduled for release on PS3, Xbox 360, Wii and Wii U August 18th in North America and August 23rd in all other regions. The game supports two player local co-op and four players online.